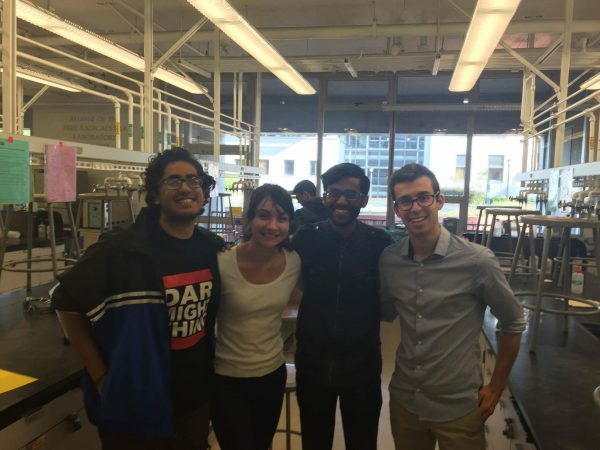 Amgen Scholar Nick Watkins (far right) met mentor and fellow Amgen Scholars Rocío Mercado (second from left) in chemistry lab at UC Berkeley. Pictured here with Mercado’s other students. The science community really is a small world. Nick Watkins and Rocío Mercado met years ago in chemistry lab at at the University of California, Berkeley. Mercado mentored Watkins when she was a graduate student instructor and he was a second semester undergrad. While they have remained in close contact since, it wasn’t until they were contacted for this story that they realized they shared something in common: They are both Amgen Scholars who participated in the program at Caltech, years apart. For Watkins, meeting Mercado was a formative experience in his career. He was in the process of declaring chemistry for a major and was trying to decide what kind of research he wanted to pursue. He began visiting Mercado during office hours to talk to her about what being a graduate student was like and the various research opportunities at UC Berkeley. Watkins is now in the process of applying to graduate school and is considering returning to Caltech, among other options. He plans to pursue a graduate degree in chemistry working on organometallics. Mercado is working on de novo molecular design as a postdoctoral researcher in the Discovery Sciences department at AstraZeneca in Gothenburg, Sweden. Both look back fondly at their time in the Amgen Scholar Program. “Being an Amgen Scholar at Caltech was the best decision I could have made for the summer before my senior year,” Watkins says. “Beyond developing my technical skills as a chemist, I cultivated meaningful connections with professors and colleagues, with whom I continue to keep in touch with.